BALTIMORE, Md. — Cathedral of Mary Our Queen held their annual Chrism Mass on Monday evening. The Chrism Mass is done once a year, during Holy Week, where clergy members renew their vows and where all of the oils used for baptisms and other Christian services are blessed. This year's service started a little differently. Archbishop William Lori started by addressing the tragedy in Paris, France, where Notre Dame Cathedral was engulfed in flames on Monday. "You feel like it’s part of you. 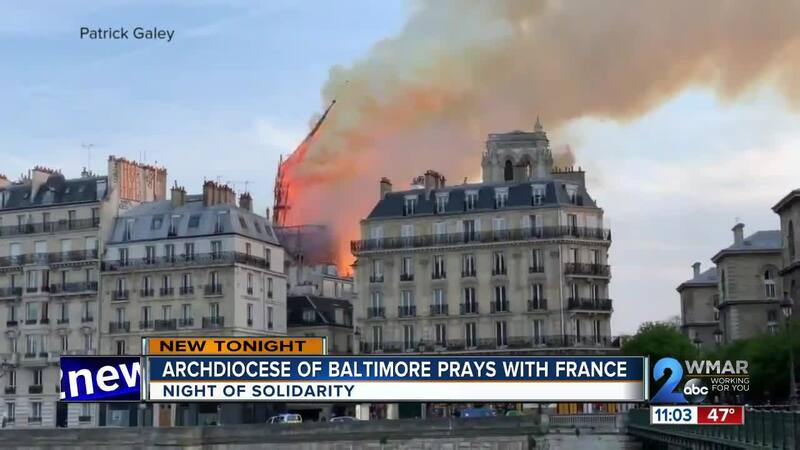 You feel like it’s woven in to the fabric of your faith, and when you look at these awful pictures and see this 12th century cathedral up in flames, it’s like a knife," said Archbishop Lori,"I think it hits home in a special way here in Baltimore." Archbishop Lori stressed how they have a great relationship with the church in France and some of the clergy were here just a few days ago. That's why he said they wanted a night of solidarity, a time to pray with France. "It's good to know that people who can’t be with you personally, physically, are with you spiritually and in prayer and in support," said Archbishop Lori. Dozens of people showed up for the mass to pray in solidarity and to be part of the Chrism Mass. Most people expressed their shock when they heard the news. "It’s so upsetting and it’s so horrible. None of it can be replaced," said Marlene Twell. She added, "It's very heartbreaking and I think it meant a lot to non-Catholics too."